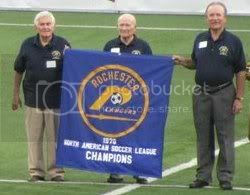 It was pretty much a perfect night to honor the Rochester Lancers and celebrate the 70th anniversary of their 1970 NASL Championship. The Rhinos certainly held up their end of the bargain with a pretty entertaining 3-1 win over the Miami FC Blues. The closest thing to a negative were the clouds that looked like they might rain on the parade. But in the end, it never did. For once, the soccer gods smiled on the Rhinos. After Austin defeated Carolina last yesterday, the Rhinos hold a 4 point lead on the Aztex with Austin holding four games in hand. While the battle for first in the USL Conference could go right to the end of the season, the Rhinos have a magic number of 8 with Carolina & Portland to lock up at least the 3rd seed in the USSF D-2 Pro League playoffs. So, if the Rhinos can get 8 or more points in their final five games, the worst they can do is finish with the third seed in the playoffs. The Rhinos magic number to clinch first place overall is 24. The Rhinos can get up to 15 points with five games remaining. They need Austin to drop at least 9 points in their final nine games to clinch first place in the league. - Saturday's in-studio guest with Jeff and I on Kick This!, former D&C Lancers beat writer Michael Lewis, has a nice article up at Big Apple Soccer.com about the two days that he tried out for the Lancers in 1976. - MLS commissioner Don Garber is once again talking about expansion into NY City. - Rafa Marquez's first MLS goal was a cracker. - MLS is off to a good start to the CONCACAF Champions League this year. - Could Columbus get two stdaiums built before DC United gets one done? - Sacha Kljestan thinks the Belgian league is a little better than MLS. - Grant Wahl looks at some of the more interesting salaries in MLS. - Bob Bradley says he is interested in the Aston Villa job. Wouldn't the news be if he weren't interested?